Yes, the more overweight men with white beards wearing red suits we see, the greater the chance it is that it's nearing Christmas. That's a good example. So, could we say this in a more statty way? There is a strong positive correlation between the number of overweight men with white beards and red suits and when Christmas is. I'm not sure how we could judge the strength, but other than that yes, we can say that there is a positive correlation between the number of overweight men we observe with white beards wearing red suits and how close Christmas is. Or maybe it's a negative correlation? I don't know. Does it matter? Yes, because the more men you see dressed up as Father Christmas, the less time it is until Christmas. But you could say that the closer Christmas is the more people we see dressed up as Santa. And that's more positive... But I suppose we're saying the same thing. 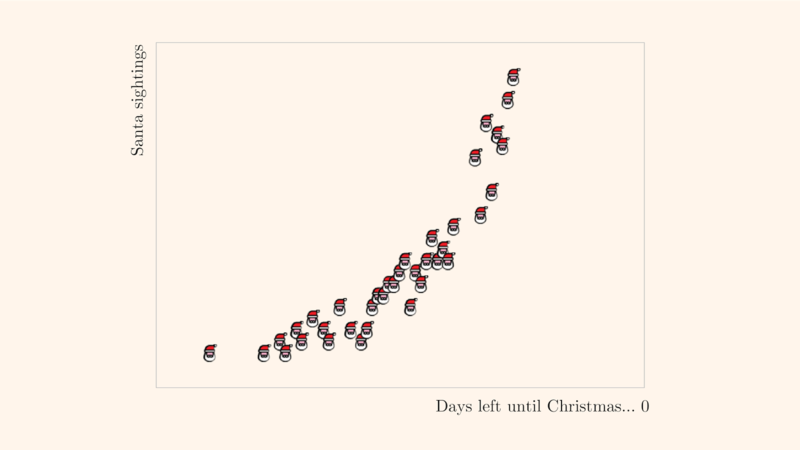 But if you drew a graph with the date on the x axis and the number of people dressed up as Santa on the y, it would go up. It would mean that you have more chance of winning a Nobel Prize if you eat a lot of chocolate. Which is why describing it in more of a statty way is safer. So, if we think about the men dressing up as Santa example in the same way, what would we be saying? What would it mean if we thought about it in the wrong way? Or that we could make Christmas come quicker by getting more people to dress up as Santa. Exactly. But the fact that we see an increase in overweight men with white beards wearing red suits as we get closer to Christmas, does not cause Christmas to come quicker does it? Do you get the distinction? If we wanted Christmas to be tomorrow would we just get millions of people to dress up as Santa? No, of course not. The important thing to get here is that correlation may suggest a relationship between two things, but it does not imply Clausality.